Nydia Fregoso, Marketing & Outreach Representative | Sun Valley Research Center, Inc.
Nydia is our marketing and outreach representative and her role is to execute the planning, development and implementation of all the organization’s marketing, communications and public relations activities. Her tasks include educating and providing information about our clinical research studies as well as discussing the services Dr. Ng’s private clinic offers to the general public and organizations within the community. She also assists with recruiting potential participants for our research studies throughout the local community and following up with potential referrals who were interested in our various studies. 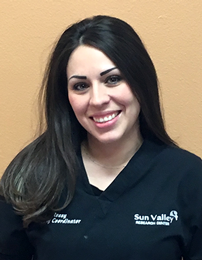 Nydia graduated from Calexico High School in 2006 and earned her bachelor’s degree in the field of Human Services from University of Phoenix in 2015. She is bilingual and has been working with our office since August 2018.